You define a tactile function not by writing an equation, but by grabbing the graph and shaping it. Functions are usually considered to be symbolic ideas that have graphical representations. What if instead we designed the graph directly and let the equation be what it may? Math teachers define functions by their graphs every time they scribble a curve on the board. If I want to show an increasing function whose graph changes concavity twice, I just draw a curve with those characteristics. It would be a lot more trouble, and less enlightening for students, to figure out an equation that has the desired features. An example I draw with chalk or marker has limitations: It’s strictly graphical, I can’t get accurate numeric information from it, and I can’t easily change its shape. But Sketchpad allows me to construct a function that’s mathematically well-defined and easy to modify. Recently my calculus students were studying parametric curves. The graphs in this topic are difficult for students to produce and comprehend, and I realized that we could explore this topic through tactile functions. In this sketch, two functions of t determine x and y coordinates of a point, located at (x(t), y(t)). The path of that point defines the parametric curve on the left. Drag t and observe how the values of x(t) and y(t) control the location of the red point on the left as it traces out the parametric curve defined by the blue and green graphs. 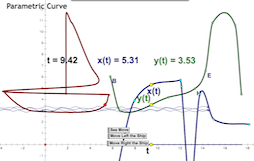 Press the link button (the triangle in the upper right corner) to see examples of the parametric curves you can make by adjusting functions x(t) and y(t). To make your own design, redefine the x(t) and y(t) functions by dragging the 8 points that determine each of them. Try to make a pretzel, a circle, a star, or your favorite letter. On the right is a sailboat one of my students made. You can download my original sketch for use with The Geometer’s Sketchpad, version 5.